Whether you are planning a short trip across town or a long trip around the world with your pet, there are certain precautions that need to be taken first, especially if your traveling companion is older. Unlike a puppy or kitten who have an endless supply of energy, older dogs and cats tend to slow down and need extra care and health check-ups. If you are planning to travel with an older pet in the near future, here are some tips to help you along the way. Talk to your veterinarian about your older pet’s health: Talking to your vet, getting all the proper vaccinations and making sure your pet is fit for travel is not only recommended but required on many major airlines. 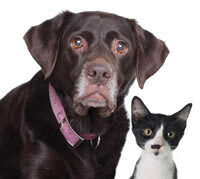 In some instances, it might be best that your pet stay with a relative or pet sitter. Acclimate older dogs and cats to crates: Whether you travel by car or by air, your pet will be safer and more comfortable in a crate. This particular part of pet travel may be harder for an older pet than a younger one, so it is crucial to start as soon as possible if your pet is not accustomed to being crated. Older dogs become very territorial of their surroundings. Older cats are accustomed to having their freedom. Both will need time to adjust to the crate. This preparation will significantly reduce travel and separation anxiety. Feed your pet only lightly 2 hours prior to travel: It takes a dog approximately 3 hours to process food. That means they may need to eliminate starting from 3 hours after you feed them. Better to feed your pet very lightly or not at all. This will also help should your pet have any motion sickness. Remember that if you’re traveling by air, the airline does not let your dog or cat out of the crate under any circumstances. If you are traveling by car, be sure and give your pet time to stretch their legs along the way. Keep familiar items with your pet during travel: This will help give your pet a sense of familiarity in an unfamiliar place. These specific toys and blankets will help ease the transition once you arrive at your final destination as well. Older dogs and cats are susceptible to health issues such as joint and bone problems, metabolism reduction, and liver and kidney dysfunctions. These health conditions could make traveling with your pet risky. It is important to be familiar with your pet’s condition before you travel. If your pet is healthy, your trip together will be well worth the effort you take to prepare. Hi Fiona – according to DirectFerries.com, there are 2 ferry routes operating between Spain and Lanzarote offering you combined total of 2 sailings per week. Trasmediterranea operates 1 route, Cadiz to Arrecife which runs 1 time weekly. Naviera Armas operates 1 route, Huelva to Arrecife which runs 1 time weekly. You would need to check with them to see if they are pet friendly. Hi.. I am thinking of moving to lanazorte around Christmas and would like to find out if their is a ship I can take from Ireland to get him their. I would like to be with him the whole way of the journey as he is 10 years old. This is a good question for your veterinarian. If they are in good health, then you and a friend or relative can fly into Paris with them in the cabin, train to Calais and take Le Shuttle to the UK to avoid the air cargo requirement. You will need a car for this option. Is it advisable to travel to the UK with two cats 12 years old. These are good things to follow with any pet, no matter the age, precautions should be taken with all.